Just back from a week in Slovenia – pretty much my favourite country full stop – a whizz around Ireland and Scotland with work is keeping me from sharing everything. This quick starting point documents this year’s snow melt at the Slap Rinka in the Logarska Dolina valley. 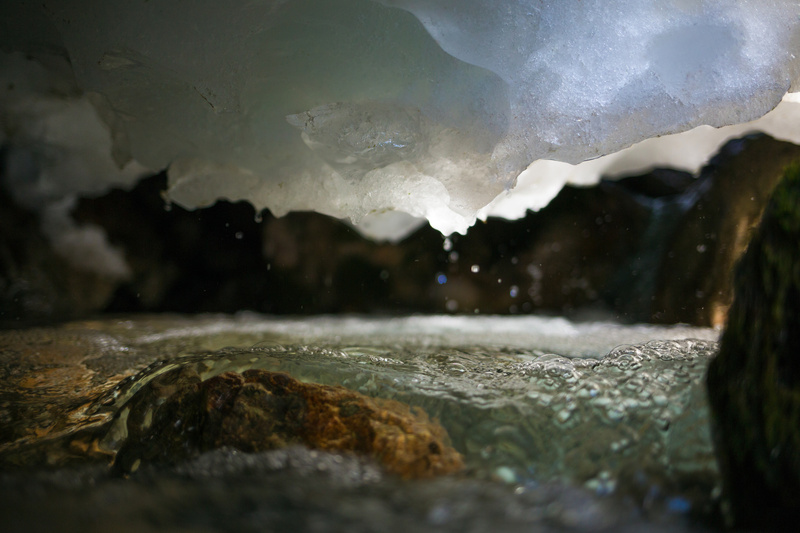 Snow here was more limited this year when we arrived – last year’s vast, frozen over cavern had turned into a claustrophobic, race-way with meltwater speeding along inches from the snow above, in a burbling rush of bubbles and bright droplets. Taking this shot then saw me kneeling in the rapids, shorts rolled up higher than decency would normally permit like a go-go dancer from an 80’s Pride festival, back, shoulders and elbows twisted between the ice and rocks to squeeze the camera into the hollow just beneath the snow, just above the water. There’s a Canon 600EX-RT fired at 1/32 power by ST-E3-RT into the opening on the right side of the shot to catch the bubbles and add some drama to the gloomy interior. I was trying for a mix of the Hollow World shot linked above, and this one – “Shooting The Rapids” from another, summer, visit and think this kind of delivers. Hope you like it! Catching up slowly! Have a great evening all!